This little shift is so cute! It is made of 100% white cotton and ties at the neck and wrist. 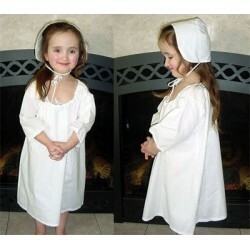 This toddler size is a 2/4 T.
This little chemise is so cute! It is made of 100% white cotton and ties at the neck and wrist. You can have your toddler wear it on hot days or have it as part of an ensemble.